"My work is influenced by texture and pattern from many sources, including Native American fabrics, Italian masonry, classic quilts, and wood marquetry." Martin Kremer's work includes fused and slumped plates and bowls with stunning form, color, and texture. The richly textured and deeply colored glass vessels highlight the magical interplay of glass and light, and are variously opaque or luminescent, playful or formal, spontaneous or intricately structured. 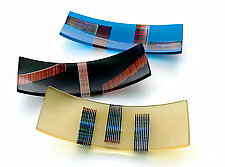 Kremer uses fusing techniques, also known as kilnforming. He begins by setting up the elements of each piece using a variety of methods in common with traditional stained glass and mosaics. Firing in an electric kiln follows at temperatures up to 1800°F. As many as four firings may be required to achieve the desired appearance and form. Grinding, sandblasting, and polishing complete the piece. Glass has been a medium of expression for Martin Kremer for more than 30 years. He began as a stained glass enthusiast while pursuing a career in medical technology. Glass gradually took over, evolving from a hobby to a spare time business to a full-time obsession. His experience includes glass workshops at Penland School of Crafts, Urbanglass, and the Studio of the Corning Museum of Glass.